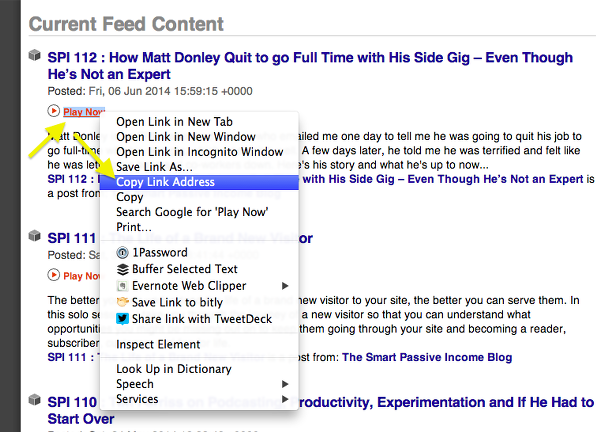 How Do I Find My Feedburner RSS and Track Links? This video is for Feedburner users. In this video, I’ll show you how to find the URLs you will need for the both the Smart Podcast Player and the Smart Track Player. Go to Feedburner.com and log in. You will see a list of all your feeds. 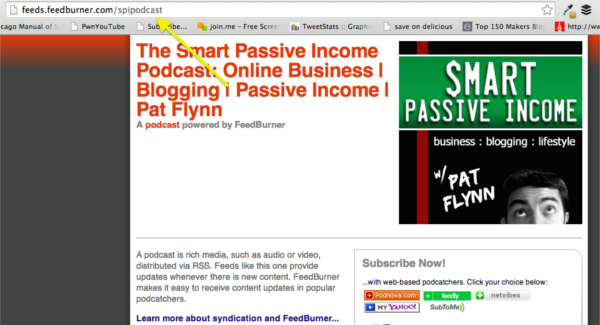 Find your podcast in the list and click on the little RSS symbol. This will open up the feed for your podcast. This is the URL you will use in Steps 3 and 4. The Smart Track Player plays single podcast episodes. For this, you will need podcast link that ends in .MP3. On your feed page here, scroll down until you find the track that you want. Hover over the “Play Now” text and right-click. Select “Copy Link Address.” This is the URL you’ll need for single tracks.